Former Communities Minister Paul Givan. FORMER DUP minister Paul Givan was warned of the impact of shutting down the Irish language Líofa bursary scheme ahead of his decision to close it, new documents have revealed. The document also suggested the option of reducing the size of the fund to avoid its closure, but six days after the five-page report was submitted, an emailed response said: “Minister has commented 'No scheme'." Two days before Christmas, Mr Givan confirmed he was withdrawing funding for the £55,000 Líofa Gaeltacht Bursary Scheme which allowed people from disadvantaged backgrounds to attend summer courses in areas of Donegal where Irish is the main language spoken. Amid widespread criticism, the minister u-turned on his decision nearly three weeks later announcing that he had found the necessary funding to keep the scheme going. The row was also described as “the straw that broke the camel’s back” by Sinn Féin’s Máirtín Ó Muilleoir in relation to the resignation of the late Deputy First Minister Martin McGuinness and the subsequent collapse of the Stormont Executive. Now The Detail can reveal that ten days before Mr Givan decided to close the fund he was officially advised that “the advantages of running the Gaeltacht Bursary Scheme are many”. The Department for Communities declined to comment on the correspondence, while the DUP failed to respond. 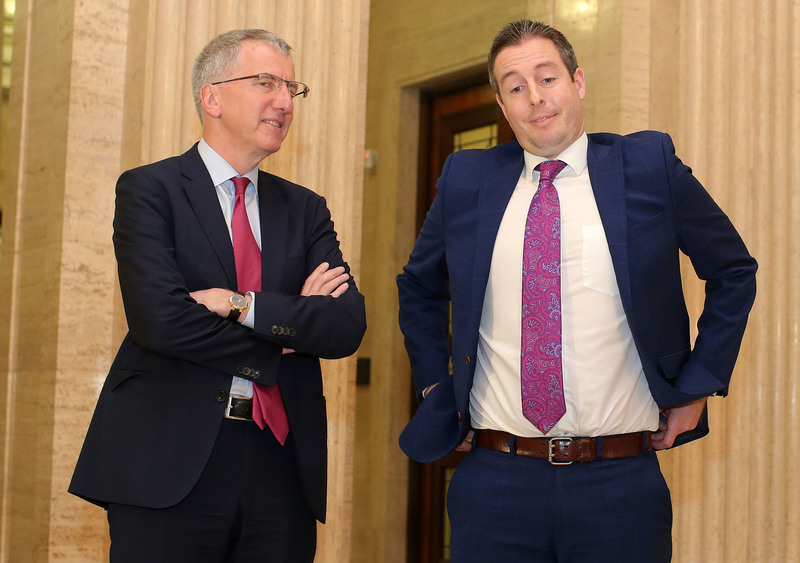 Sinn Féin former Finance Minister Martin Ó Muilleoir, left, and DUP former Communities Minister Paul Givan pictured at Stormont following the resignation of the late Deputy First Minister Martin McGuinness which was, in part, blamed on the decision to close an Irish-language bursary scheme. The release of the internal report follows an earlier story by The Detail which revealed the role of DUP leader Arlene Foster in a row over Irish language signage, while separate documents highlighted a failure to equality test the closure of the Líofa bursary scheme. The ministerial briefing paper that has now emerged, which is dated December 13, 2016, described the disadvantages of not running the scheme as “the potential for negative media attention, and less young people and adults able to afford to attend the Gaeltacht to improve their Irish this year”. It also pointed out that the initiative helped the department meet a number of Programme for Government (PfG) commitments including building a “creative society where people can fulfil their potential”, promoting a “shared society that respects diversity”, plus giving “children and young people the best start in life”. In addition to meeting three commitments of the Executive’s Programme for Government, the document said that the language fund also helped meet a government target to get more people to improve their Irish. The document also stated: “Without departmental funding the majority of the 96 students who completed the course [in 2015] would not have been able to afford to take part in the scheme. Of the 100 successful applicants this year, 73 were in receipt of social security benefits, and 23 were receiving tax credits (in work benefits). The documentation revealed that the minister was advised of a second option of keeping the fund open while halving the number of available places from 100 to 50 at a cost of £27,000 rather than the £55,000 earmarked for the full scheme this year. An email, released under Freedom of Information legislation, which was sent to the author of the Líofa briefing informing her of the minister's decision to close the scheme. The new documents were released by the Department for Communities just before the Easter weekend, on Thursday, April 13, after civil liberties group the Committee on the Administration of Justice (CAJ) challenged an earlier Freedom of Information decision to block publication of documents relating to the fund's closure. CAJ Deputy Director Daniel Holder told The Detail: "We are pleased we won the appeal and the information has now been released. The minister had invoked a Freedom of Information exemption relating to ‘free and frank exchanges of views’ with officials and the documents were originally withheld on this basis. “There is however nothing ‘free and frank’ about the sole official document the minister received. It’s a formal options paper setting out the background to the bursaries scheme. Commenting on the implications of closing the fund, the ministerial briefing paper states “there would be an impact on our progress towards getting 20,000 people signed up to Líofa – one of the criterion for application to the scheme is that the young person must be registered with Líofa and have pledged to improve their learning of Irish”. According to the Líofa website, more than 19,430 people have signed up to the initiative so far. The Gaeltacht bursary scheme was one of the mechanisms to support the Líofa policy. The internal correspondence released to the CAJ revealed a yearly increase in the number of applications to the fund since it was established in 2012, including a 41 per cent rise from 361 in 2015 to 510 in 2016. A table showing the number of applications and the cost of the Liofa bursary scheme since its inception. Source: Department for Communities. The cost of the course peaked at £53,575 in 2014 when 135 people were offered bursaries. This was reduced to 100 grants in each of the following two years when the scheme had an annual cost of around £44,500.